Sign up to Dry July Australia 2018 and raise funds for Manning Hospital, Taree. 2018 Funds will go toward a Cancer, Exercise and Wellbeing Program Help us raise funds to support regional NSW cancer patients. Manning Cancer and Palliative Care provides a broad range of specialist services to the residents of Greater Taree, Great Lakes and Gloucester Local council areas. Currently patients living with Cancer in the Lower Mid North Coast don’t have access to a cancer survivorship or exercise program. 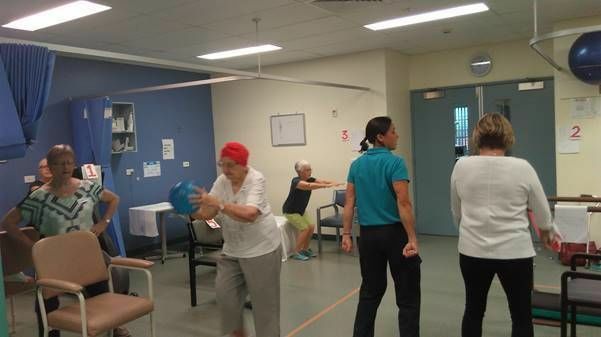 Using Dry July funding, the aim would be to complete a 12 month trial of a group program for people with cancer which incorporates exercise as well as information, support and strategies to care for themselves holistically. Living with cancer can cause physical and emotional stress which impacts on quality of life. This group program will aim to provide guidance and confidence for exercising as well as support on integrating all aspects of their health – physical, emotional and spiritual. Our goal is to provide an opportunity for patients to take control of their cancer journey and overcome some of the effects of their disease and treatment. InForm Manning: A Cancer, Exercise and Wellbeing program has been funded through 2017’s Dry July campaign. 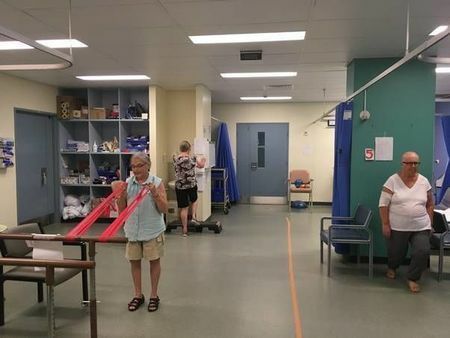 InForm Manning is an 8 week program where participants attend and participate in an exercise program, as well as have morning tea together and look at wellbeing or cancer education topics. One program has just completed where all participants demonstrated an improvement in their physical function, quality of life, ability to manage their symptoms, as well as 100% satisfaction in the program. The first round of InForm Manning started on the 20th February 2018 and finished on the 10th April. This program will continue in 8 week blocks throughout 2018 due to Dry July Funding. When we returned home it was still there, so I diligently had it investigated. I assumed it would be of no consequence as l thought the chance of me having breast cancer was negligible - I had no family history and had breast fed four children. So much for that.The tests came back showing a nasty little carcinoma, poised to take off through my body. And of course I subsequently found out that my supposed protective evidence was not protective at all - I now know the main risk factors for breast cancer are getting older and having breasts! Oh dear. I immediately became part of the well-oiled machine that is breast cancer treatment. A mastectomy was quickly followed by a lymphatic clearance and then it was off to chemotherapy. During the initial discussions, the Scalp Cooler was mentioned as being available. I had assumed that I would lose my hair as a matter of course so even though hair loss had no bearing on my decisions about my treatment, I thought I would give it a go. I also assumed that Scalp Coolers were available to all chemo patients in all hospitals. Again I was totally wrong and did not realise how incredibly lucky I was to have access to a machine in Taree. The results of the Scalp Cooler have been amazing. I lost a little of my hair on top of my head but no one except for me (and my hair dresser) could really notice it. In fact, when l went on to the next stage of my treatment several weeks after finishing my "nasty" chemo at the Port Macquarie Radiation Centre, most of the staff could not believe I had had treatment as I still had a full head of hair. The actual process of wearing the Scalp Cooler is not the most fun thing in the world. l found entertaining myself whilst wearing it, particularly wlth a funny movie, distracted me from focussing on the sensation of a frozen head! Being engrossed in a conversation for the first few minutes was also very diverting. I still have a bit of treatment to go (well a few years worth actually), but hopefully the worst bits are behind me. And certainly. I have to say that looking in the mirror and seeing normal (though at times haggard) face looking back at me has lessened the "life changing" effects of cancer treatment. 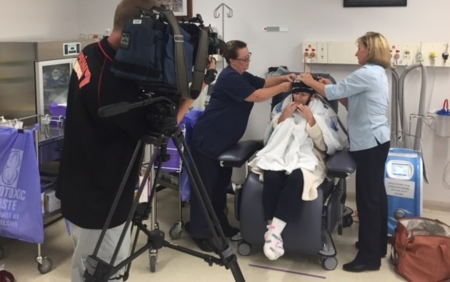 Manning Hospital in Taree will put Dry July funds towards a new a scalp cooling device. The scalp cooling device can decrease or stop hair loss for some patients undergoing chemotherapy. Hair loss is one of the major side effects that causes anxiety in chemotherapy patients. Support from Dry July will be supplemented with additional funding. 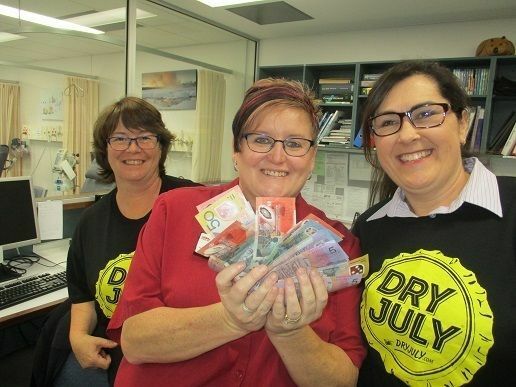 The staff at Manning Hospital held a barbeque to celebrate the launch of Dry July, and were very pleased with the results!